For an even richer brownie you can add frosting. 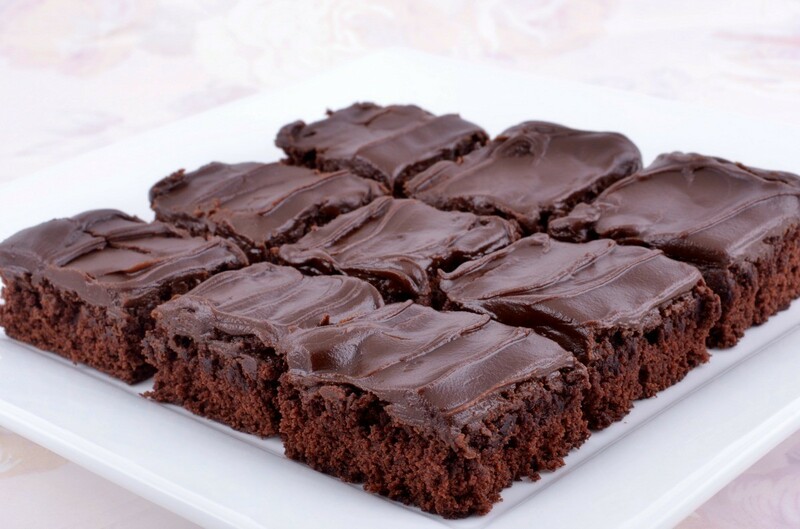 This page contains frosted brownies recipes. Preheat oven to 350 degrees F. In small bowl, combine flour, baking powder, and salt; set aside. In large bowl, combine butter, brown sugar, and vanilla; beat until creamy. Add eggs, 1 at a time, beating well each time. Gradually add dry ingredients. Stir in nuts. Divide dough in half. Blend chocolate into half. Spread chocolate batter into well greased 9x13 inch pan. Spread plain batter evenly over chocolate layer. Bake for 30-35 minutes. Frost when cool. Cream together the margarine and sugar, add eggs, flour and syrup. Mix well and add nuts, if desired. Bake for 30 minutes at 350 degrees F in a greased, floured cookie sheet with lip. Frost with frosting below. For Frosting: Boil first three ingredients for 1 minute. Remove from heat and add chocolate chips. Beat until spreading consistency. Preheat oven to 400 degrees F. Grease an 8-inch square baking pan. In a large heavy saucepan over low heat, melt 8 tablespoons of butter and chocolate, stirring constantly. Remove from heat and stir in granulated sugar, a teaspoon of vanilla and eggs, one at a time. Blend in flour, and walnuts. Spread in pan and bake until brownies just start to pull from sides of pan, 18 to 20 minutes. To prepare frosting: In a medium bowl with electric mixer, beat remaining butter and vanilla until creamy. At low speed, gradually add confectioners' sugar and cocoa, alternating with milk, beating well after each addition until frosting is smooth and fluffy. Frost brownies when removed from oven by gently spreading on. Cut into 16 squares. In a microwave safe bowl, melt 1 cup chocolate chips and butter with coffee granules; stir until smooth. Cool slightly. In a large mixing bowl, beat eggs and brown sugar; stir in chocolate mixture and vanilla. Mix the above ingredients at medium speed for 1 minute. Put in jellyroll pan that has been greased with butter or sprayed with non-stick cooking spray. Bake 25 minutes at 350 degrees F.
I volunteer at a zoo and would like to bring "zebra brownies" to our next volunteer meeting. I am trying to figure out to to put a zebra pattern (edible) on top of a pan of brownies. Any suggestions on what to use to do this? The easier the better, please. Just buy the Little Debbie zebra cakes and bring them in. It will be fine.